Peanut butter. Chocolate. Chewy. What more could you want in a snack? I have emptied out my fair share of store bought granola bar boxes, but it’s kind of scary what all is in there. I’m really trying to eat more real stuff this year and you know what? Real is way better and so easy. 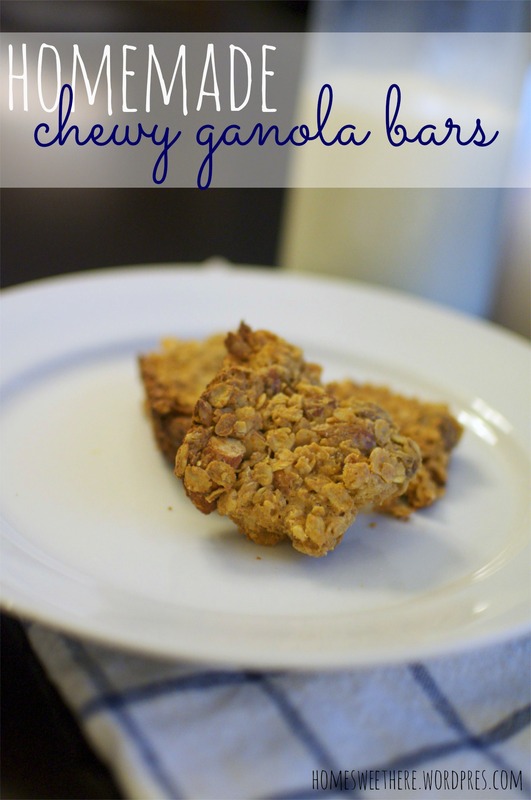 In my quest to find some better breakfast options, I searched and searched for a granola bar recipe that wasn’t too crazy. I didn’t want to have to make a trip to Trader Joe’s for native-natural-free range-organic something every time I wanted to make them. I found recipe after recipe and the one I liked the best was from How Sweet It Is and that was my starting point. I adapted it based on our taste and what we had in the pantry. 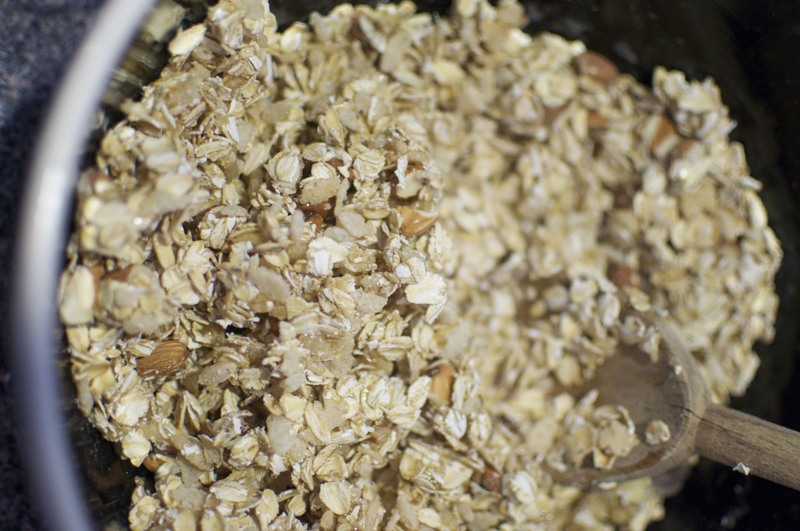 You want to start with 3 cups of Old Fashion Oats then add 1 cup of Rice Crispie type cereal (the unsweetened kind) to give it little pockets of crunch. 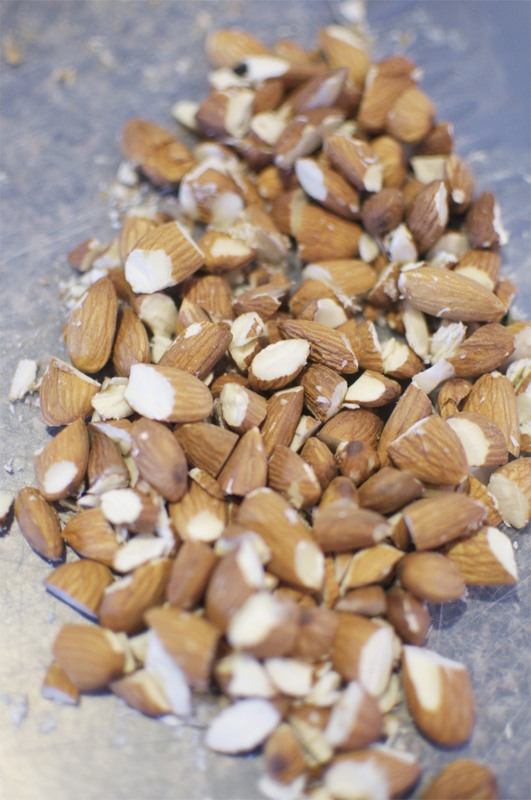 Then add 1/2 cup of roughly chopped almonds and mix them all together in a large bowl. Trust me on the large bowl thing. I made that mistake. 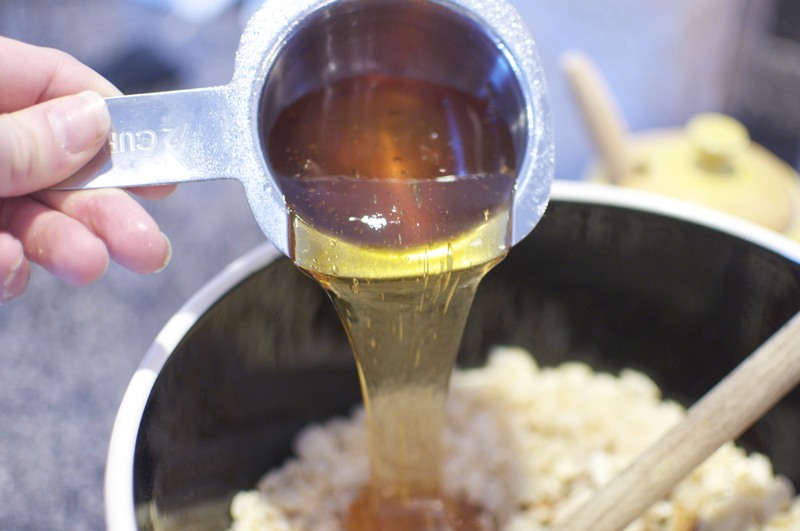 Add 1/2 cup of real honey. Stir with a wooden spoon until it all comes together. 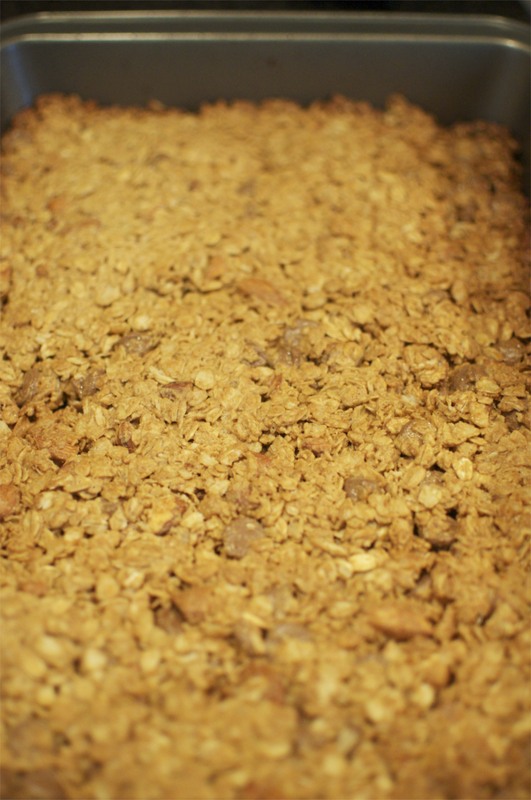 It will be sticky, but the honey will fully incorporate into the grains. Now comes the fun part. 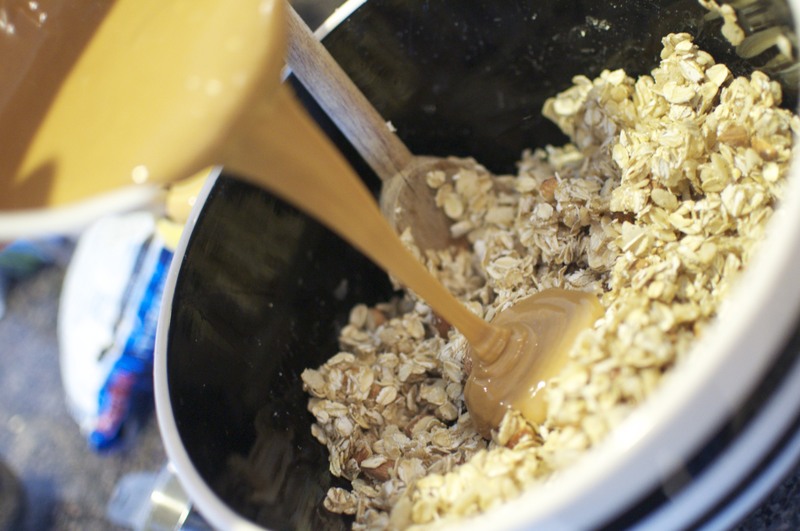 Add 3/4 cup of melted natural peanut butter. If you have not tried natural peanut butter, put it on your list. The flavor is amazing. I’ve tried a few different brands and they are all so yummy. The melted part is as important as the natural part. If you’ve never melted peanut butter, do that too. It’s like heaven from the microwave. Throw in your chocolate chips and stir the PB in until it’s all combined. It will still be kind of sticky, but you can tell when it’s ready. 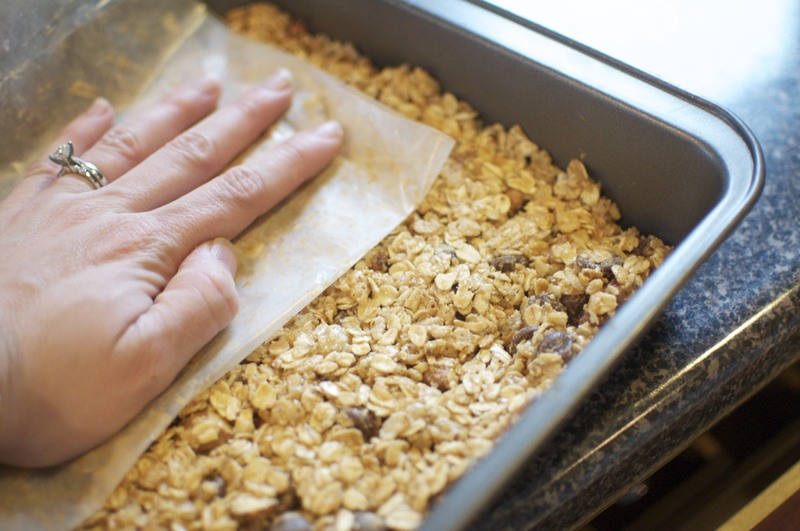 Just pour it out into a greased 9×13 pan and press it down with wax paper. You can use your hands, but be prepared to lick. Bake it in a 350 oven for 20-25 minutes. You’ll be able to smell when it’s done. 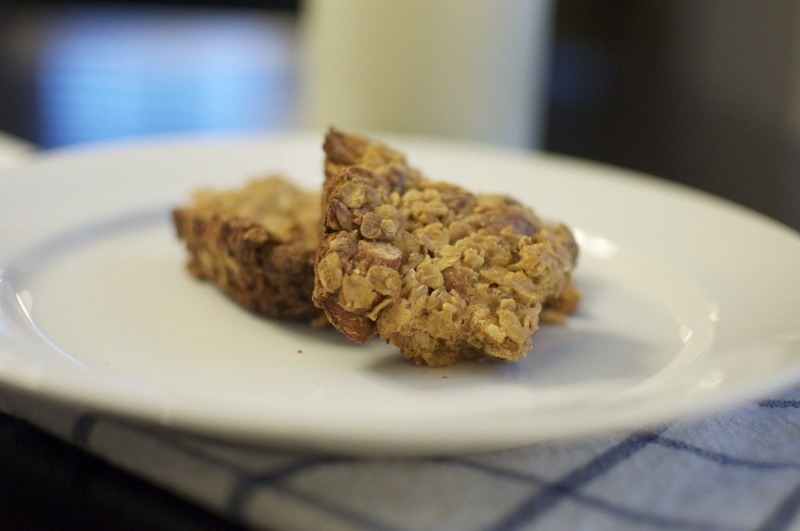 Let them cool for just a few minutes before enjoying with cold milk. Just be warned, they probably won’t cut in pretty little sticks like Quaker so go with squares. You’ll thank me later. You can also opt not to bake at all. They are gooeyer (real word), but there is nothing wrong with that. And to make things even easier, I’ve added a printable recipe for you. I hope you enjoy this yummy treat as much as we have. You can really mix anything you want it in them- different nuts, raisins, cranberries, PB chips, toffee bits. Or dip them in chocolate. The possibilities are limitless. 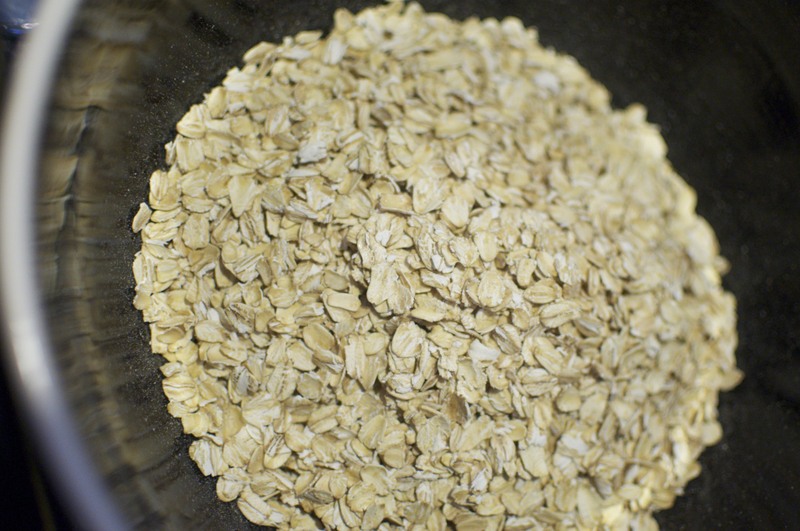 What “healthier” snacks have you been making? If you happen to make these please let me know how they turned out or what you mixed in for fun. Also let me know if you like getting recipes here. I would really like to start doing that more often since cooking is something I absolutely love to do and do it daily. If you would like to see more, please say so! You can leave a comment or send me an email at homesweethere@gmail.com.